Model produced from special material and loaded with 2 layers of Glass Fiber. 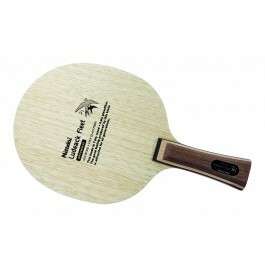 Recommended for top players due to dynamic power which also helps to transmit lots of spin. Made in Japan. Брал для знакомого, он доволен. Raquete veloz com controle muito bom. Indico está raquete para jogadores atacantes. везде пишут 90 г моя весит 81,5 г. Дерево без вибраций довольно быстрое, контрольное немного поэластичнее , чем POWER , карбон очень тонкий и его совсем не чувствуется, играть очень приятно, а вот изготовлено очень плохо: ручку пришлось возле лопасти проклеевать с обеих сторон, также пришлось зачистить лопасть и ручку наждачной бумагой уж очень они были шершавые. Ludeack Fleet is a great blade. Its what you imagine a cross between a 7-ply wood and a composite to be. You get the good ball feeling of an all-wood blade, the long throw/deep penetration of a 7-ply, but its also thinner and more wieldy than most 7-ply blades without losing power. And it has a nice ping sound when you hit into the composite fiber on the big shots! This is for the players who prefer 7-ply wood, but who want to move closer towards a 5-ply composite. Unfortunately Nittaku's handles all feel different and have different dimensions, but Ludeack Fleet's handle is great. It doesn't feel like you're holding a pencil (like most Nittaku FL), but it doesn't feel like a brick either (Nittaku L-size FL). 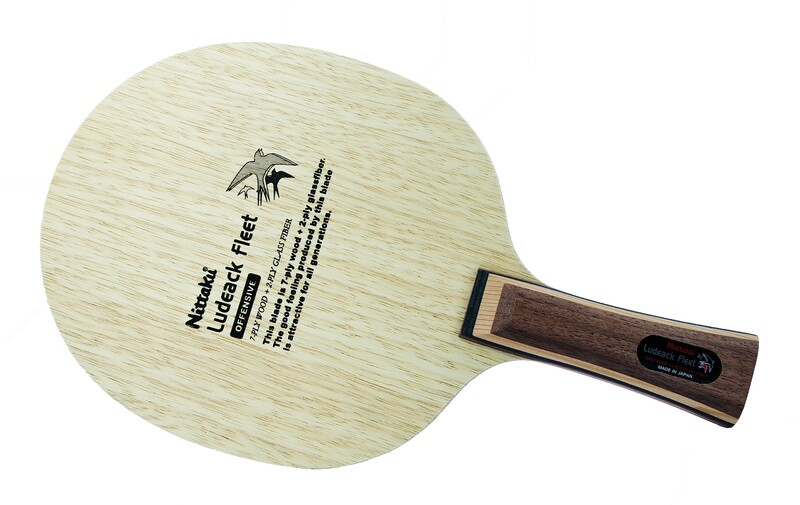 I wouldn't say this blade is too fast or too stiff for me, but for my game the throw is a bit too long... You need to use more table on your topspins and blocks. However that's my complaint with most 7-ply woods. If you want unlimited range and crushing power with good ball feeling, this blade has it. But if you like to have a tighter arc on your topspins without having to brush the ball too thin, then stick to 5-ply composites. Regardless, this blade will stay in my collection! The best blade i have played with so far! The blade is medium fast, I would categorize it as OFF. Though it has 9 plies ( 7 Wood + 2 glass fiber) it offers plenty of feel to the ball and plays forgiving when hitting off center by accident. This is supported by its slightly enlarged hitting face. The top feature for me of the Nittaku Ludeack Fleet is it´s edged ST handle, since I do not like straight handles which are kind of round. In combination with the soft finish gripping the blade feels comfy and -this might be important for those of you who play pimples on one side- switching sides with different rubbers is easy and swift! Quality wise the Nittaku Ludeack Fleet is able to stand up to the best blades on the market, no matter if they come from Butterfly (even when custom made) or Darker or whatever brand. After this blade arrived last week, I directly ordered another one, because it is just outstanding! My rubber combination for this one is Stiga Clippa (short pips), 2.0mm on both sides. Best wishes to you all and thanks to Tabletennis11 for their great service againg. При такой мощности отличный контроль, отличное чувство мяча. Куда мяч направляешь, туда он точно и летит. Основание для истинных гурманов настольного тенниса. Это основание, создано на основе популярнейшей модели LUDЕАСK. Характеристики основания значительно улучшены за счет добавления производителем двух слоёв стекловолокна glass fiber. Основание Nittаku Ludеаck Flееt ОFF – это мощное семислойное основание, оно немного тяжелее и быстрее, чем классическая версия. Семь слоев дерева и два слоя волокон glass fiber дают игроку превосходное увеличение мощности, сохраняя при этом отличное чувство и отменный контроль. Качество склейки и обработки, а также дизайн данного основания находятся на непревзойденном уровне! expensive blade, but craftsmanship is superb. Very long dwell time gives me great confidence when attacking, i can play continuous looping rallies quite comfortably. Enough power to put away the point when opportunity arises. Stable and solid feel when blocking. One of best blade which I ever meet before. Price is equal to quality. very, very good blade. high price, but for this famous characteristics in playing offensive tt, its okay. Fantastic blade. I feel Ludeack Fleet is softer and easier to control than Ludeack.